Armendariz rings are defined through polynomial rings over them. Polynomial rings over Armendariz rings are known to be Armendariz; we show that power series rings need not be so. D.D. Anderson and V. Camillo, Armendariz rings and Gaussian rings, Comm. Algebra, 26(7) (1998), 2265-2272. E.P. Armendariz, A note on extensions of Baer and pp-rings, J.Australian Math.Soc., 18 (1974), 470-473. N. Bourbaki, Elements of Mathematics, Commutative Algebra, Addison- Wesley, 1972. J.W. Brewer, Power Series over Commutative Rings, Marcel Dekker, New York, 1981. A.M. Buhphang and M.B. Rege, Semi-commutative modules and Armendariz modules, Arab J.Math.Sc., 8 (2002), 53-65. R. Gilmer, A note on the quotient field of the domain D[[X]], Proc. Amer.Math.Soc., 18 (1967), 1138-1140. ISNAD Rege, Mangesh B. , Buhphang, Ardeline Mary . "INTEGRALLY CLOSED RINGS AND THE ARMENDARIZ PROPERTY". 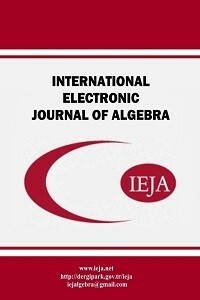 International Electronic Journal of Algebra 1 / 1 (June 2007): 11-17.